The Atlantic Crossing between Europe and the United States is the quintessential ocean voyage. Why? Apart from being one of the historically busiest shipping routes in the world, it is chapter one of many of the world’s greatest stories, including the discovery of what is now the United States of America by European navigators. The great, often treacherous North Atlantic has been fought over and blockaded in wars; such has been its importance to international trade and commerce. From the time of Columbus in 1492, and possibly earlier, seafarers have braved these waters to build civilisations, ship all manner of cargo, smuggle, plunder and wage war. The passage became increasingly important as the great nations expanded their empires and influence, building all-weather vessels specifically for the arduous 3,000 NM ocean voyage. In the days of sail, a typical eastbound voyage took over three weeks until the introduction of steam in the early 19th century. Steam power allowed vessels to improve their more difficult outward (westbound) time against the Gulf Stream winds and the race to build faster and bigger ships was on. In 1935, Arthur Hales, a UK merchant, shipowner and politician instigated the now famous trophy that bears his name for the “Blue Riband”, the fastest westbound journey by a passenger vessel in regular service. 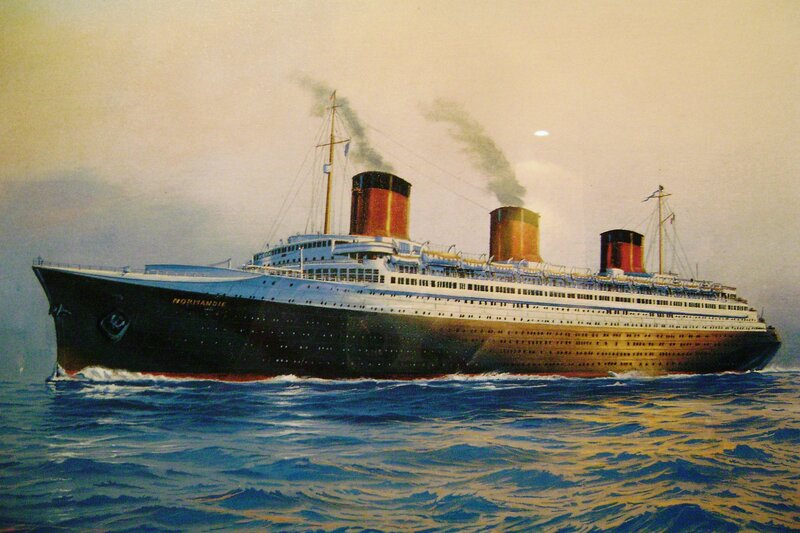 The first official recipient was the French liner SS Normandie, which completed her maiden voyage on 29 May at just under 30 knots. Since that time, only two other ocean liners have shared that accolade, the RMS Queen Mary and the purpose-built SS United States, who captured the title with an average speed of 34.5 knots on 15 July 1952 and has held it ever since. This superlative vessel also smashed the eastbound record one week earlier with a stunning 35.59 knots. Since the retirement of SS United States in 1969, the “Blue Riband” is deemed to have ceased as no regular fast passenger service now exists. However, in the age-old spirit of competition, the Hales Trophy is still awarded for the fastest commercial vessel crossing in either direction. Serial show-off and entrepreneur, Sir Richard Branson, did manage to break the record in 1986 by just two hours with his Virgin Atlantic Challenger, but was denied the trophy because his 1440kW speedboat was not a commercial vessel. The same fate was levied against the massively ambitious 45,000kW GE jet-powered Destriero of the Aga Khan which crossed in August 1992 at over 53 knots. Yet the final word in the Hale Trophy remains with the proud Tasmanian company, Incat, builder of the world’s fastest commercial passenger catamarans. Since 1990, three of the company’s vessels have held the prize, with the current holder, HSC Fjord Cat, the first to cross in less than three days at an average speed of 41.3 knots.